The most noticeable feature of the Ring-tailed Lemurs is their tail. Measuring 56 to 62 cm in length it has black and white rings around it. Ring-tailed Lemurs have a grey or rosy brown back with a white stomach; their hind legs are a lighter shade of grey or rosy brown. Ring-tailed Lemurs have white faces with triangular black markings around their eyes and black noses. Habitat: Wild Ring-tailed Lemurs can be found in Madagascar. Lemurs prefer gallery forests and Euphorbia bush habitat but will also live in many other types of forest. 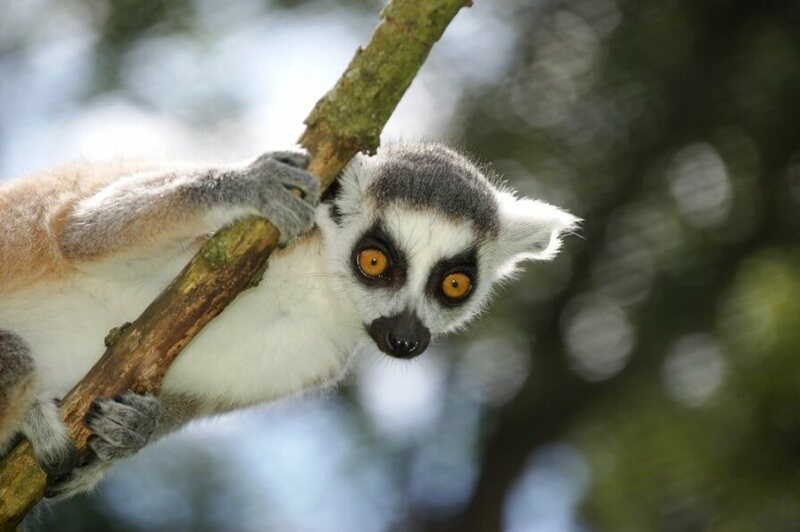 Lemurs spend most of their time in trees but also spend a large proportion of the day on the ground. Population: In Madagascar there are some stable populations of Ring-tailed Lemur, however all Lemur species are threatened by habitat loss. Lifespan: Up to 18 years in the wild and 33 years in captivity. Diet: Ring-tailed Lemurs are predominantly vegetarian with their diet consisting of approximately 70% fruit, with the remainder of their diet being made up of leaves, bark, sap, flowers and the occasional insect. They feed from many different species of plants and trees, but particularly enjoy Kily trees. Behaviour: Ring-tailed Lemurs are active during the day. They spend more time on the ground than other Lemurs and move around on four feet across the forest floor. Females are dominant to males. Groups of females switch infants, baby-sit, form play groups and even allow infants other than their own to nurse. Ring-tailed Lemurs often interact socially while feeding and sunbathing. Sunbathing occurs during the early morning hours before feeding. Ring-tailed Lemurs can be seen sitting upright with their front legs resting on their hind legs, exposing their stomachs to the sun.